The “super skin” developed by Stanford University researcher Zhenan Bao is self-powering, using polymer solar cells to generate electricity. The “super skin” developed by Stanford University researcher Zhenan Bao is self-powering, using polymer solar cells to generate electricity. The solar cells are not just flexible, but stretchable — they can be stretched up to 30 percent beyond their original length and snap back without any damage or loss of power. The foundation for the artificial skin is a flexible organic transistor, made with flexible polymers and carbon-based materials. To allow touch sensing, the transistor contains a thin, highly elastic rubber layer, molded into a grid of tiny inverted pyramids. When pressed, this layer changes thickness, which changes the current flow through the transistor. The sensors have from several hundred thousand to 25 million pyramids per square centimeter, corresponding to the desired level of sensitivity. To sense a particular biological molecule, the surface of the transistor has to be coated with another molecule to which the first one will bind when it comes into contact. The coating layer only needs to be a nanometer or two thick. “Depending on what kind of material we put on the sensors and how we modify the semiconducting material in the transistor, we can adjust the sensors to sense chemicals or biological material,” she says. Bao’s team has successfully demonstrated the concept by detecting a certain kind of DNA. The researchers are now working on extending the technique to detect proteins, which could prove useful for medical diagnostics purposes. “For any particular disease, there are usually one or more specific proteins associated with it — called biomarkers — that are akin to a ‘smoking gun,’ and detecting those protein biomarkers will allow us to diagnose the disease,” Bao says. The same approach would allow the sensors to detect chemicals, she said. By adjusting aspects of the transistor structure, the super skin can detect chemical substances in either vapor or liquid environments. Regardless of what the sensors are detecting, they have to transmit electronic signals to get their data to the processing center, whether it is a human brain or a computer. Having the sensors run on the sun’s energy makes generating the needed power simpler than using batteries or hooking up to the electrical grid, allowing the sensors to be lighter and more mobile. 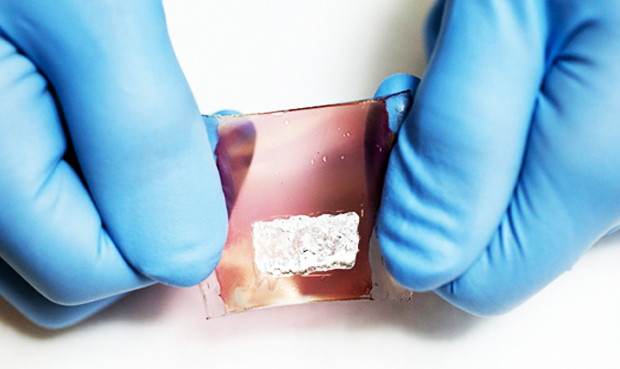 And having solar cells that are stretchable opens up other applications. A recent research paper by Bao, describing the stretchable solar cells, will appear in an upcoming issue of Advanced Materials. The paper details the ability of the cells to be stretched in one direction, but she said her group has since demonstrated that the cells can be designed to stretch along two axes. The cells have a wavy microstructure that extends like an accordion when stretched. A liquid metal electrode conforms to the wavy surface of the device in both its relaxed and stretched states. “One of the applications where stretchable solar cells would be useful is in fabrics for uniforms and other clothes,” says Darren Lipomi, a graduate student in chemical engineering in Bao’s lab and lead author of the paper. Stretchability would be useful in bonding solar cells to curved surfaces without cracking or wrinkling, such as the exteriors of cars, lenses and architectural elements. The solar cells continue to generate electricity while they are stretched out, producing a continuous flow of electricity for data transmission from the sensors. Bao says she sees the super skin as much more than a super mimic of human skin; it could allow robots or other devices to perform functions beyond what human skin can do. Finally, Bao has figured out how to replace the materials used in earlier versions of the transistor with biodegradable materials. Now, not only will the super skin be more versatile and powerful, it will also be more eco-friendly. it just might take us tomorrow.